With so much of our country dry and burning up , I was checking things yesterday and thanking the big Guy for all my blessings, I did slip in a little request for a small window of opportunity. I'm thinking to start cutting on Saturday and if the hay gets rained on twice just rake it and burn it. I was counting on a good 4 week 3rd cutting for the heifers but that didn't work out. I'd like to cut my back field but I'm afraid a three day window won't be enough since there is one to two inches of water standing on it and they are calling for more rain today and I think the rest of the week. M-5 wrote: With so much of our country dry and burning up , I was checking things yesterday and thanking the big Guy for all my blessings, I did slip in a little request for a small window of opportunity. I’ve got some cows that would love to get into that....be nice to get a cutter on it too. What type of hay is that? AKE wrote: What type of hay is that? Technically it's still grass and won't be hay till it's dry but it's Tifton 85. Dang.....I believe that’s the prettiest Tifton I’ve seen. Thank you, like I said I've been blessed with rain and good conditions , 85 loves the N too. Whew! I’m glad you cleared that up. 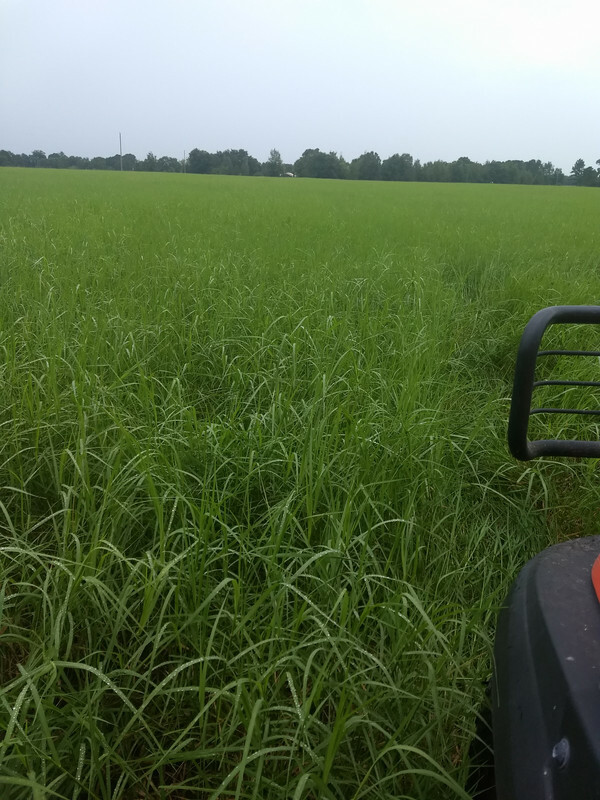 I had no clue what he meant when he asked what kind of hay that was; not even the clues of people writing about mowing and the picture of your field helped. I must say, though, it looks great! 85 is rolled , took a little doing , half inch of rain yesterday Teddered today at 12:30. Reraked at 3 started baleing at 4. Low humidity mild temps and clear blue sky. It hasn't rained here at the house yet, but at the hayfields might be a different story. I had a good rain while I was cutting yesterday and it was still wet this afternoon. My millet is ready to bale tomorrow, rain permitting. I'm ready to get after it and move to another project.